What a topsy turvy NRL season we’ve had so far. I think I can safely say that I’ve never seen a team lead the competition despite a negative for-and-against record. How unpredictable is it? I’d hate to be a punter. The most obvious reasons for this unpredictability are the changes around the interpretation of the ruck and the banning of the third tackler below the knees, which have clearly made the game much faster. A faster game can really help a roster that suits a flat, direct style of play, in the way that the Titans, the Tigers, and the Eels, among other clubs, are playing. 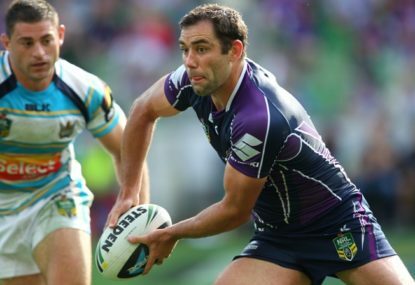 By contrast, pre-season premiership favourites – the Roosters and the Storm – are taking some time to adapt. The Roosters have the best roster in the competition. There’s no doubt about that. And somehow they’ve managed to lose two games this season where they’ve conceded just the one try. That’s practically unheard of! But they’re struggling to score points and that’s because they naturally play a little deeper in attack than some other clubs, and with the faster ruck speed, this less direct approach with the ball is hurting them. With smart coaches at the helm, it’ll only be a matter of time before they get it right. Similarly, the Storm have been masters over the years at using tactics like the wrestle to slow down the play-the-ball. This season, the prevalence of two-man tackles has made that more difficult, and by their standards they’re leaking points as a result. The Storm are just not used to defending fast play-the-balls for long periods of a game. So they’re taking time to adapt. Everyone is struggling to get their head around how teams can be so good one week and then so poor the next. It’s not uncommon for some sides to be up and down this early in the year, but it’s very uncommon to have nearly the whole competition doing it. It’s too early at this stage to say whether the rule changes are creating a better or worse competition. Either way, there’s no doubt it’s a different competition. Over the past few years, most sides have been playing a watered down version of the Storm game-plan. Now, many of these same teams are playing a lot flatter with the ball. The speed of the ruck determines your approach to attack. And I think it’s fair to say that a lot of the halves – who control the point of attack – don’t know yet how to best play under these rules. Give them time, they’ll figure it out. I think the fast ruck speed suits a less structured and more ad lib style of play. But not for all teams. Just those with the roster to pull it off successfully.